Great! Send a photo from the TOP of one of those babies! Paul and Babe are WAY north of Avenue of the Giants...about 100 miles. These are Paul and Babe's cousins. Who, just coincidentally also have the names, Paul and Babe! I agree! And thru the Memorial Day holiday too. This area is just fantastic to spend some time in. 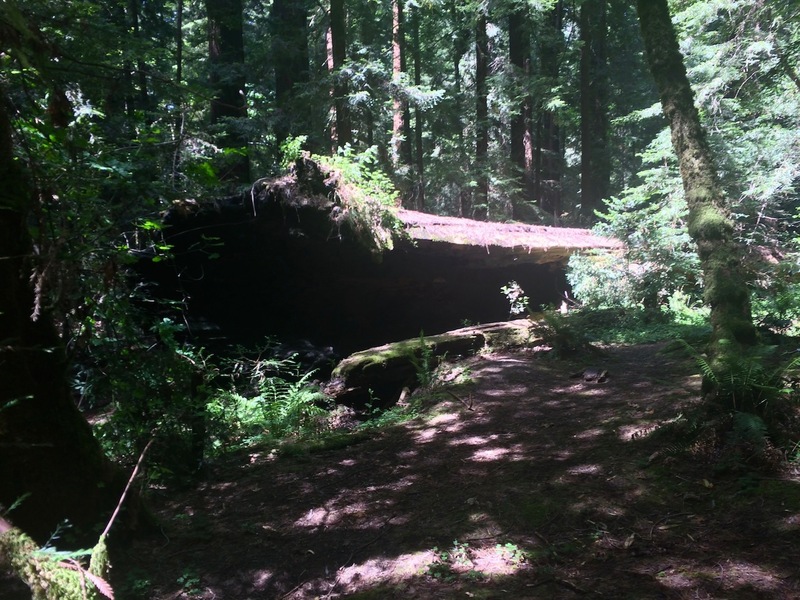 Our Camp is right inside Avenue of the Giants. I'm scratching my head over that one. If the door was locked before you left for Giant Redwoods RV Park, the door is not likely to pop open. Are you pretty sure no one entered Scampy when you were not looking? Check around to see if anything else is missing. The latch that secures the door may have developed a problem staying closed. Just a few minutes ago, a gust of wind blew that closed door open. I am keeping an eye on that latch to try and figure out what is going on. George, we had a dead-bolt lock installed on our Hi-Lo RV because we did not feel "warm and fuzzy" about the flimsy locking mechanism on the Hi-Lo when we bought it in 2009. Without that dead bolt, we could have easily had the same thing happen. I wish to learn how other Scamp owners have dealt with door opening issues. Avenue of the Giants - what a drive and Humboltz Redwood Park, wow! We visited there in September 1999 on our way to Whidbey Island and have always remembered it as a favorite place. 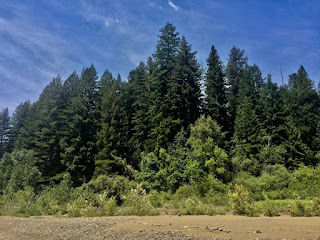 Our son just visited the first week of May this year and was equally enthralled with the Redwoods and as Sam said "you just need to see them for yourself". George enjoy every moment and be sure to look for the yellow banana slug and maybe even get the T-shirt! I agree! And I get to spend a week up here exploring! It was reported earlier that there was a suspected frypan theft ring operating in the area! Bill, LOL! That is hilarious. (I'm rolling in the floor laughing with tears in my eyes!). It doesn't take much to entertain me. You heard about that too! At breakfast this morning at the local cafe, that theft ring was the major topic of conversation! I am locking Scampy's door from now on. I want to protect my brand new frypan! I haven't posted in a long time but I have checked in since about day one,I'm so glad to see you on the road and enjoying life. and join and ask how to fix the door so it won't come open when driving. Their are a lot of people their that have 13'Scamps that will help you. I worked at Giant Redwoods for a couple of months last year. I love the area. I hope you enjoy it. Yes! This place is lovely. Nice park. Beautiful redwoods!! Hey George, Did you see the new landslide that occurred on Rte 1? Pretty huge, and will cut off access for the local folks indefinitely ! I just read the news! This slide shows the inevitable and unstoppable process of Mother Nature. Building a road close to the Ocean is madness. George, I actually tie my RV door shut from the inside with velcro strapping. Even after being "adjusted" several times, I never trust it. When my motorhome was new, I hit a bump at 55 in Rocky Mtn National park. The door flew open and caused the steps to deploy. They hit a log along the edge of the road that the park service had put there to keep people from parking to watch the elk. That meant I now had a lower step 4" to the rear of the top step so it would not fold back up! Got someone to bang it back into shape, but never trusted that door again.